Tomorrow morning we set off on our year of adventuring! We’re beginning our travels in France — where Carl spent many youthful summers camping and surfing with family and friends, where he and I took our first international trip together, where we’ve celebrated weddings and births, and where we’ve made a summer home for the past several years. Our one-way tickets from New York to Toulouse are booked, and from there we’ll arrange around-the-world tickets and set our itinerary in a little more detail. We’ve decided to focus on a small number of countries and spend extended periods of time in each, something that will be more difficult to achieve in the future when we’ll be working around school holidays and office vacation days. 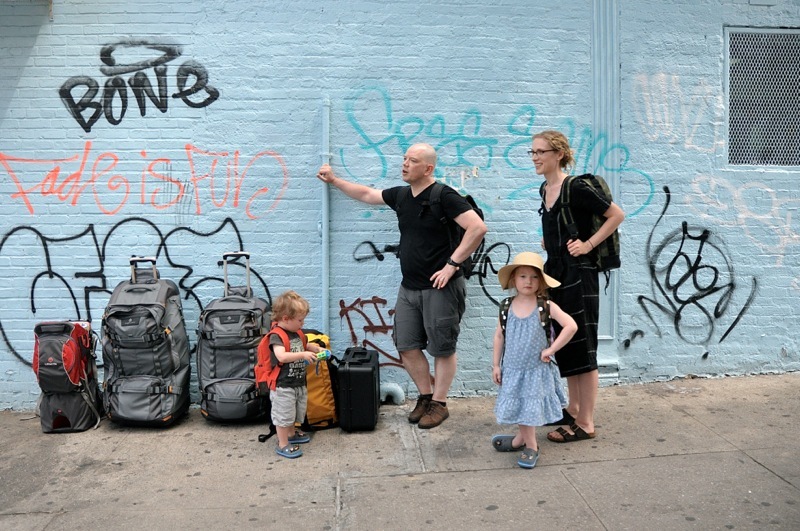 We wanted to explore at least some countries neither Carl nor I have visited, prioritize spending time with Carl’s sister and family who live in Australia, make sure there was plenty of time spent outdoors, and simply focus on enjoying life together as a family of four. This sounds amazing and we look very much forward to hearing about all of your adventures. Can’t wait for all the updates from this unbelievable adventure! You guys are bold and incredible. Have the best time! Hugs and kisses to Goose and Max. Wow! You & Carl are amazing, bold & brilliant! I will love following your adventures! Leah, I am Libby’s Mom and love that you and your family are taking this year. What a gift. I look forward to reading and following your adventure Monday blog.